"These rolls are soft and delicious and mixing them up in a bread machine makes them easy." Place bread flour, water, sugar, egg, 2 tablespoons softened butter, yeast, and salt into the pan of your bread machine in the order recommended by the manufacturer. Select the Dough cycle and press Start. When the cycle is complete, remove the dough and press down to deflate. Divide dough into 15 equal pieces and form into rolls. Place rolls in prepared baking dish, brush with melted butter, and cover dish loosely with plastic wrap; let rise until doubled in volume, about 30 minutes. 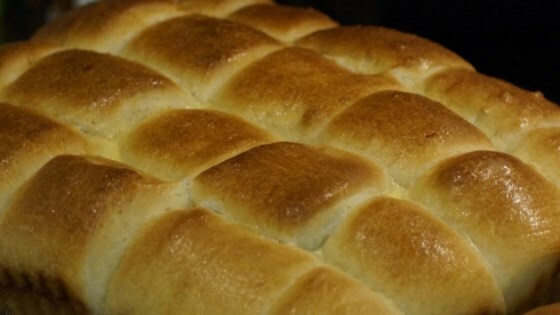 Bake rolls in the preheated oven until the tops are golden brown, 12 to 15 minutes. Although easy to make, they seemed day old right out of the oven. They weren't the 'soft' rolls I was looking for or expected from such a highly rated recipe.